Due to the high rental and sale prices currently prevailing in Colombo and other urban areas, many young professionals and students in Sri Lanka prefer renting apartments and homes with roommates rather than getting them on their own. This is affordable and very convenient, especially if you are planning to travel to the city centre daily. However, from the initial step of looking for a trustworthy roommate to sharing a common space with them, this process can be a learning curve. It’s important to set rules and expectations from the start and to start as you mean to go on, with mutual respect. When you are sharing your space with another person, the key to maintaining peace is to have an effective communication system among the members of the household. Communicate early and clearly in order to avoid any confusion and/or misunderstanding. It’s always better to have a roommate to whom you can talk openly, someone who you can discuss house matters with. You don’t have to be close friends with your roommate, but it’s a good idea to live with someone whose communication style is compatible with yours. Always make sure that you delegate each task and responsibility evenly among the those living in the apartment. You shouldn’t be the only person working hard to complete household chores, neither should you sit back and let others do all the work for you. Sharing equal responsibility for shared spaces helps keep the peace, leaving no room for complaints or any misunderstanding. When bills are shared among roommates, consider keeping them in a place that’s visible to everyone, with the deadline written on the envelope. This way, each person is aware of what’s going on, and what they are responsible for. It’s important to understand that not everybody is like you. Some people prefer late night company and some people wake up early in the morning. Your roommates’ music taste may totally differ from yours. Some of your roommates may not be interested in long conversations. Therefore being polite and respecting each other’s privacy will contribute to forming good relationships between you and your roommates. Ask before borrowing, knock before you enter a room, do your own dishes, be mindful about the volume of your music. The people you are living with may not be from the same cultural background or from the same neighbourhood as you are. They might be even older or younger than you. For this reason, being open minded about is crucial. Make an effort to do things together and keep an open communication system with them. Sharing the same space with a completely different person can be am amazing experience. You might come across various interesting differences, and certain aspects of other people’s habits may seem unsettling to you. However, despite the differences, you are able to learn and look at life from a different perspective through living with those who were previously strangers to you. Every day is a learning experience that will teach you how to work with different individuals and be more empathetic towards them. 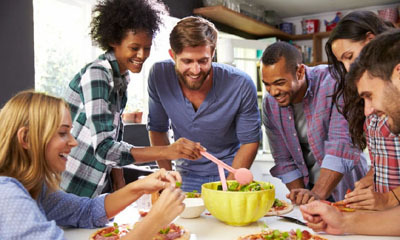 Make the most of your flatshare!